SXSW is going on down here in Austin. That means thousands of artists, writers, film people, musicians and foodies of all types are here learning like crazy. Except me. I’m here without one of those thousand plus dollar tickets. Ah, but that’s fine for this year. I’m enjoying it all vicariously for free through the local newspaper and bands playing in bars and on sidewalks. I have to admit, I’m a touch jealous. Alright, I'm insanely jealous. There are some very cool food blogger topics I don’t get to be a part of. Plus, there’s a secret dinner in a secret location with secret chefs I'm dying to go to. No dice. Not this year. However, as tickets are way cheaper ahead of time I’ll be in the middle of the action next year, absorbing into my brain everything there is to learn. Instead, I’m on vacation and I love Austin. Fresh amazing food, cool city and lots of art type people who play outside all the time. It feels like I fit right in for a change. At home I’m sort of the foodie-artist-photographer-oddball. Maybe I was Texan in a past life. These lemon bars come from the talented multitasker medical student by day, amazing cook by night Joanne from Eats Well With Others. She adapted them from Smitten Kitchen. I didn’t adapt them at all. They were thick and luscious without my help. Unfortunately they were so thick and lemony and luscious, I had to hide the batch in my refrigerator behind bottles of beer and hot sauce. Refusing to eat the pan by myself, I repeated over and over, “There are no lemon bars in the fridge”. It didn’t work. However, I did leave town before they were gone. So in a way, I won. Remember to bake the crust first. I nearly screwed up that part. Of course, I also had a lot of packing on my mind. I'm sure you'll do better than me and read the instructions first. Right? 1. Preheat the oven to 350 and grease a 9x13-inch baking pan. 2. For the crust, cream together the butter and sugar until light in the bowl of an electric mixer fitted with the paddle attachment. In a separate bowl, combine the flour and salt and, with the mixer on low, add to the butter and beat just until mixed. Put the dough on a well-floured board and form into a ball. With floured hands, flatten the dough into the baking pan. Chill in the freezer for 10 minutes. 3. Bake the crust for 15-20 minutes or until very lightly browned. Let cool on a wire rack. 4. For the lemon layer, whisk together the eggs, sugar, lemon zest, lemon juice, and flour. Pour over the crust and bake for 30 to 35 minutes or until set. Let cool to room temperature. Cut into squares or triangles. Sprinkle with powdered sugar, if desired. Recipe via Joanne from Eats Well With Others. Adapted from Smitten Kitchen. Picture by Laura Flowers. One of these days I'm going to have to attend a foodie function ;). Hey, fabulous shot!!!!!!! I think you managed to somehow get the best lemons in the us that day. I am making these THIS WEEKEND! They look delicious! I'm glad. You'll love these ones! My dad and I would go absolutely gaga over these. His favorite desserts are those with lemon, and after making my first batch of lemon bars from scratch, I can never go back to those boxed ones! These look divine! I might be a texan also. Or maybe I'm just not meant to be a medical student because I certainly the food-obsessed oddball in my class. And I'm thoroughly okay with it. I am SO happy you made these! And yes you totally won by leaving before they were finished. i won't tell you how quick the batch got finished off in my apartment. Not my strongest moment. I adore lemon bars. These sounds awesome! Ok these just look fabulous! Super spring-like and refreshing! My mouth is watering! Susan next year! Let's do this! 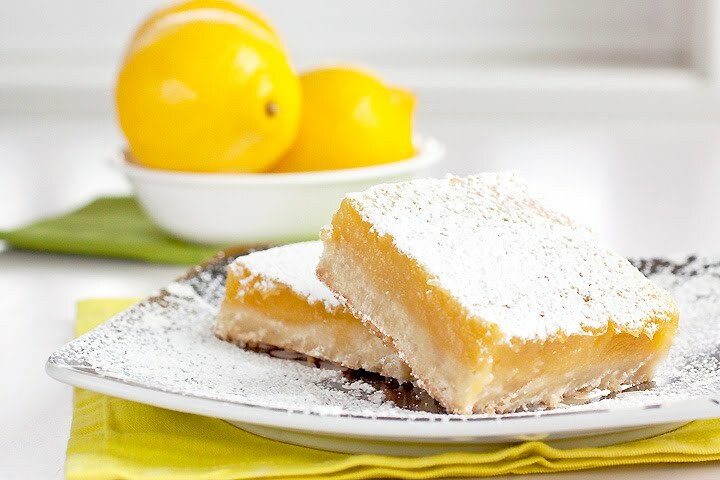 Oh goodness, these lemon bars are calling my name. Quite loudly too! Lemon Bars are my favorite! I'm so sorry I've been so absent. I meant to call you yesterday. I've been working non-stop this week, and life has been crazy. Are you still in town? I'll message you my number if you are and maybe we can connect tomorrow. Much love, sweet lady! hey Laura! My hubby is on a plane right now, on his way back from SXSW. (He was there for the interactive bit). Imagine how I felt when he texted me to say he was at a secret Foo Fighters gig. I just hope he's loaded up on presents, that's all I'm saying. Haha you're not making these easy to resist. The fact that I can't get Meyer lemons around here is though! But I may just have to make them with normal lemons. Lemon bars always remind me of my best friend who's far away in London. They're her favorite! As for SXSW, I'm sorry you're missing out this year but I'm sure you'll have an amazing time next year :). Shaz that's awful. Great for your husband though. I hope he had a good time. Next year can you go with me? It would be a total blast! Oh I love lemon. Great Springtime recipe! Oh, how I love lemon bars! I need to find some Meyer lemons to make the real deal! Laura, I have yet to go to a blogging function or meet one bloggy friend:( Maybe this will be the year...2012 for sure! I always find out about the events when they're over. I love the look of those lemon bars! And by the sound of the event I can see why you are 'not' jealous that you couldn't go! mmmmh...si sente anche il profumo...che bontà...,complimenti! Sono entrata a far parte dei tuoi "seguaci" :), il tuo spazio web è favoloso! The meyer lemon bars look delicious! I'd have eaten the whole batch too - they look too tempting. Ohh that looks good. I love lemon bars. Oh my god these look literally amazing! !